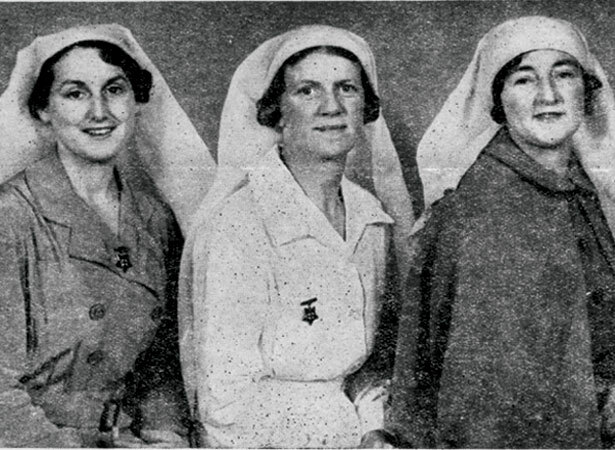 The only organised New Zealand contingent to serve in the Spanish Civil War were New Zealand Spanish Medical Aid Committee (SMAC) nurses René Shadbolt, Isobel Dodds and Millicent Sharples. On the day they were to leave Auckland, police interrogated them about their reasons for going. Though the nurses were released in time to board the Awatea for Sydney, SMAC wrote to the government demanding an explanation and inquiry. Neither was forthcoming, although Police Minister Peter Fraser eventually admitted that the government had over-reacted to a fear that ‘three dedicated revolutionaries [would be] flying New Zealand’s flag in Spain’. The nurses arrived in Spain on 15 July 1937. Posted to a makeshift hospital in Huete, south-east of Madrid, Shadbolt and Dodds remained there until mid-1938, when the hospital moved to Barcelona. By this time, Sharples had returned to New Zealand. Dodds and Shadbolt arrived back in New Zealand in January 1939. In February they embarked on a speaking tour to raise awareness of, and money for, the hundreds of thousands of Republican refugees in France. We have 4 biographies, 1 article, related to New Zealand nurses detained on way to Spanish Civil War.